When’s the last time you did something nice for a stranger? Liam Murphy, from Cork, Ireland, did on August 16th, when he took his Dubai cab driver to an amusement park. 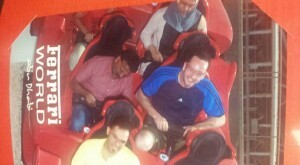 Murphy, a test engineer, was on a business trip in the United Arab Emirates, but decided to spend his Sunday at Ferrari World, an indoor theme park. When he found out that his taxi driver, Shakiha, had never been to the park—in his 14 years living in the area!—and planned on waiting in the cab—for four hours(!! )—Murphy asked Shakiha to tag along. Murphy bought him a ticket (approximately $68) and that was that. If only there were more Murphy types in the world, it would be a better place. Hopefully, though, it’ll encourage you to pay it forward and do something nice and unexpected for someone you come across, cab driver or not.